Reza Ramon 2 years ago. Android Nougat 7.1 ROM, OnePlus X Lineage OS 14.1 has now arrived via an UNOFFICIAL build and also the OFFICIAL build. Also, here comes the Lineage OS 15 for OnePlus X. 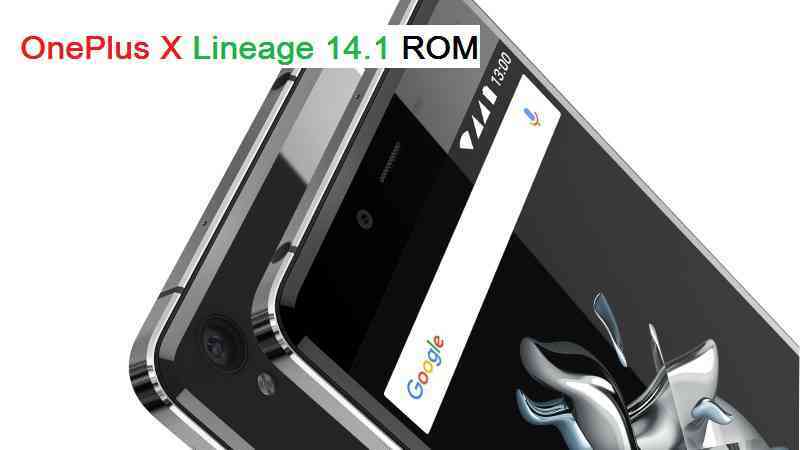 If you want some more Lineage ROMs then stay tuned the Lineage OS 14.1 ROM collection page. Before this there was the CM14.1 for OnePlus X. This Lineage OS 14.1 for OnePlus X (onyx) is brought to you by developer NeroD and I think the official LINEAGE OS build is brought to you by developer ashwin007. If you like this ROM then do consider a donation to ashwin007. THIS IS AN INITIAL BUILD WHICH MAY NOT BOOT AT ALL. HAVE A BACKUP BEFORE FLASHING THIS AND TRY AT YOUR OWN RISK. Installing a custom ROM on a OnePlus X (onyx) requires the bootloader to be unlocked on the OnePlus X (onyx) phone, which may VOID your warranty and may delete all your data. Before proceeding further you may consider backup all data on the phone. You are the only person doing changes to your phone and I cannot be held responsible for the mistakes done by you. – Here is theTWRP update guide for the OnePlus X (onyx). This TWRP recovery guide requires an unlocked bootloader on the OnePlus X (onyx). Download and Copy the GApps and OnePlus X Lineage OS 14.1 ROM ZIP to your phone. First flash the OnePlus X Lineage OS 14.1 ROM ZIP from device. Then flash the GApps zip from your device memory. Reboot and Enjoy the Nougat 7.1 Lineage OS 14.1 ROM for OnePlus X (onyx). Copy the latest OnePlus X Lineage OS 14.1 ROM ZIP file to your phone. Stay tuned or Subscribe to the OnePlus X (onyx) forum For other Android Nougat ROMs, Lineage OS 14.1 ROMs, other ROMs and all other device specific topics. I try and enjoy it!!! May I ask, where is the source for this build?? I guess NeroD is the developer of the unofficial Lineage OS 14.1 ROM for OnePlus X. You can ask him for the source of this ROM. Here goes his XDA profile. @shibaa987 Are you already get permission from respected Devs for posting his work. Don’t get it wrong, AFAIK Nerod never publish his unofficial branch of LOS14 yet. @reza_ramon No, I have not asked permission to publish his work. But I always gave credit to his work (or any other developers in this matter), any donation link to the developer(s) (because I understand how much it takes to port Android for a device or FIX the BUGs in a ROM) and I always give a link to the development thread (if any). Yeah, I knew that the source code were not released (or at least I was unable to find the source tree by him anywhere) and hence I placed his XDA profile link, so that you can get it from him if he has uploaded it to some public repo !! @shibaa987 you shouldn’t post any rom project that eventually not released by the respective developers. I mean, maybe there’s a reason why it is not, maybe it’s so buggy… or worst, it can brick the devices, who knows..
Maybe you should ask nerod about the status of this build. Until further information from him, you have to remove the link to the unofficial build ASAP, before some noobs blame you for bricked their device. I’m just telling you.. It’s your call.. Cheers.